The Flomenhaft Gallery is proud to present our annual Women Only exhibition from January 14 to February 20, 2016. Included are Janet Davidson-Hues, Jody Guralnick, Laura Murlender, Miriam Schapiro and Jaune Quick-to-See Smith. We have subtitled it Something Old, Something New because we have often shown the work of Jaune Quick-to-See Smith and we represent the art of Janet Davidson-Hues. It was also our privilege since 2005 to represent the art of Miriam Schapiro, who recently died. 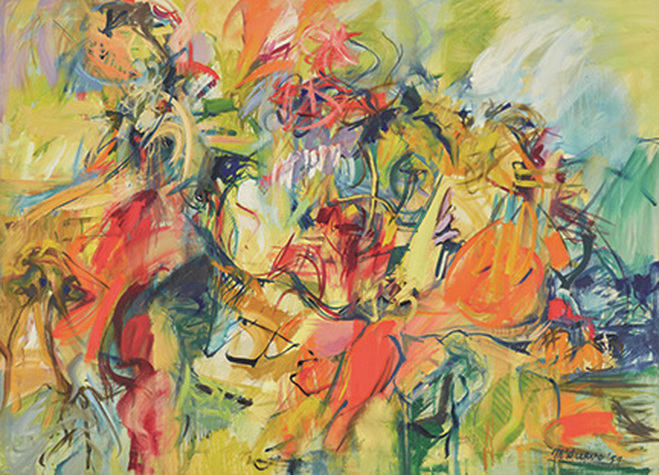 Her painting, Fresh Air (1957) is included in this show. It is of the same period and style as Fanfare (1958) which will be included in the forthcoming retrospective of her art to be presented by the National Academy Museum and School, New York City, from January 28 to May 7, 2016. We will also exhibit Time (1988-1991). It is a work that includes femmage, an outcome of the women’s art revolution she instigated with Judy Chicago in 1970. Time was the first major painting in her collaboration series that portrays her close association with Frida Kahlo. New to our gallery and to this exhibit are Jody Guralnick and Laura Murlender who we have recently encountered and whose work we are very excited about. Murlender has recently been awarded the Memorial Foundation for Jewish Culture Grant. She also received the American-Israel Foundation Grant, the Helena Rubinstein Foundation First Prize, the Samuel First prize in visual Arts-Canada, and the French Government Grant.